Other early premillennialists included Pseudo-Barnabas, Papias, Methodius, Lactantius, Commodianus Theophilus, Tertullian, Melito, Hippolytus of Rome and Victorinus of Pettau. By the 3rd century there was growing opposition to premillennialism. Origen was the first to challenge the doctrine openly. 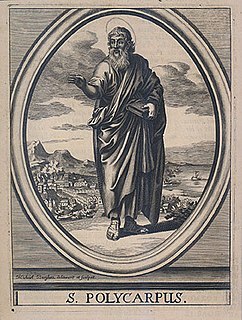 Dionysius of Alexandria stood against premillennialism when the chiliastic work, The Refutation of the Allegorizers by Nepos, a bishop in Egypt, became popular in Alexandria, as noted in Eusebius’s, Ecclesiastical History. Eusebius said of the premillennialian, Papias, that he was "a man of small mental capacity" because he had taken the Apocalypse literally. Christian communities came to adopt some Jewish practices while rejecting others. Only Marcion proposed rejection of all Jewish practice, but he was excommunicated in Rome c. 144 and declared heretical by the growing proto-Orthodoxy. Infant baptism was widely practised at least by the 3rd century, but it is disputed whether it was in the first centuries of Christianity. Some believe that the Church in the apostolic period practised infant baptism, arguing that the mention of the baptism of households in the Acts of the Apostles would have included children within the household. Others believe that infants were excluded from the baptism of households, citing verses of the Bible that describe the baptized households as believing, which infants are incapable of doing. In the 2nd century, Irenaeus, bishop of Lyons, may have referred to it. Additionally, Justin Martyr wrote about baptism in First Apology (written in the mid-2nd century), describing it as a choice and contrasting it with the lack of choice one has in one's physical birth. However, Justin Martyr also seems to imply elsewhere that believers were "disciples from childhood", indicating, perhaps, their baptism. The so-called Apostolic Tradition says to "Baptize first the children, and if they can speak for themselves let them do so. Otherwise, let their parents or other relatives speak for them." If it was written by Hippolytus of Rome, Apostolic Tradition could be dated about 215, but recent scholars believe it to be material from separate sources ranging from the middle second to the fourth century, being gathered and compiled on about 375–400. The 3rd century evidence is clearer, with both Origen (calling infant baptism "according to the usage of the Church") and Cyprian advocating the practice. Tertullian acknowledges the practice (and that sponsors would speak on behalf of the children), but, holding an unusual view of marriage, argues against it, on the grounds that baptism should be postponed until after marriage. Institutional Christian monasticism seems to have begun in the deserts in 3rd century Egypt as a kind of living martyrdom. Anthony of Egypt (251-356) is the best known of these early hermit-monks. Anthony the Great (251-356) and Pachomius (c. 292–348) were early monastic innovators in Egypt, although Paul the Hermit (c.226/7-c.341) is the first Christian historically known to have been living as a monk. There is historical evidence that individuals were living the life later known as monasticism before the legalization of Christianity. Anthony the Great was the first to specifically leave the world and live in the desert as a monk. Anthony lived as a hermit in the desert and gradually gained followers who lived as hermits nearby but not in actual community with him. One such, Paul the Hermit, lived in absolute solitude not very far from Anthony and was looked upon even by Anthony as a perfect monk. This type of monasticism is called eremitical or "hermit-like." As monasticism spread in the East from the hermits living in the deserts of Egypt to Palestine, Syria, and on up into Asia Minor and beyond, the sayings (apophthegmata) and acts (praxeis) of the Desert Fathers came to be recorded and circulated, first among their fellow monastics and then among the laity as well. While Bauer's original thesis has been criticised, but Elaine Pagels and Bart Ehrman have further explicated the existende of variant Christianities in the first centuries. They see early Christianity as fragmented into contemporaneous competing orthodoxies. Eamon Duffy notes that Christianity throughout the Roman Empire was "in a state of violent creative ferment" during the 2nd century. Orthodoxy, or proto-orthodoxy, existed alongside forms of Christianity that would become extreme deviance, or "heresy", in the near future. However, Duffy states that during this period the orthodox and unorthodox were sometimes difficult to distinguish and that Early Christianity in Rome had a wide variety of competing Christian sects. Some orthodox scholars argue against the increasing focus on heterodoxy. A movement away from presuming the correctness or dominance of the orthodoxy is seen as understandable, in light of modern approaches. However, these orthodox scholars feel that instead of an even and neutral approach to historical analysis that the heterodox sects are given an assumption of superiority over the orthodox movement. The Ante-Nicene period saw the rise of a great number of Christian sects, cults and movements with strong unifying characteristics lacking in the apostolic period. They had different interpretations of Scripture, particularly the divinity of Jesus and the nature of the Trinity. Many variations in this time defy neat categorizations, as various forms of Christianity interacted in a complex fashion to form the dynamic character of Christianity in this era. The Post-Apostolic period was extremely diverse both in terms of beliefs and practices. In addition to the broad spectrum of general branches of Christianity, there was constant change and diversity that variably resulted in both internecine conflicts and syncretic adoption. 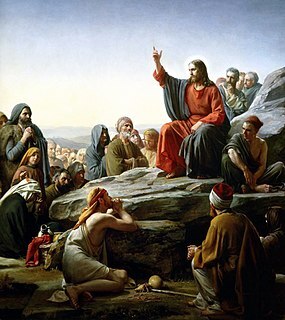 Christianity differed from other Roman religions in that it set out its beliefs in a clearly defined way, though the process of orthodoxy (right belief) was not underway until the period of the First seven Ecumenical Councils. Early attacks upon alleged heresies formed the matter of Tertullian's Prescription Against Heretics (in 44 chapters, written from Rome), and of Irenaeus' Against Heresies (ca 180, in five volumes), written in Lyons after his return from a visit to Rome. The letters of Ignatius of Antioch and Polycarp of Smyrna to various churches warned against false teachers, and the Epistle of Barnabas accepted by many Christians as part of Scripture in the 2nd century, warned about mixing Judaism with Christianity, as did other writers, leading to decisions reached in the first ecumenical council, which was convoked by Emperor Constantine at Nicaea in 325 in response to further disruptive polemical controversy within the Christian community, in that case Arian disputes over the nature of the Trinity. By the end of the third century proto-orthodoxy became dominant. It viewed Christian teachings as either orthodox or heterodox. Orthodox teachings were those that claimed to have the authentic lineage of Holy Tradition. All other teachings were viewed as deviant streams of thought and were possibly heretical. Jerusalem was an important church center up to 135. It had the prestige of being the city of Christ's death and resurrection, and was the center of the Apostolic Age, but it experienced decline during the years of the Jewish–Roman wars (66-135). The First Council of Nicaea recognized and confirmed the tradition by which Jerusalem continued to be given "special honour", but did not assign to it even metropolitan authority within its own province, still less the extraprovincial jurisdiction exercised by Rome and the other sees mentioned above. Some theorize that the split of early Christianity and Judaism in the mid-2nd century eventually led to the determination of a Jewish canon by the emerging rabbinic movement, though, even as of today, there is no scholarly consensus as to when the Jewish canon was set. 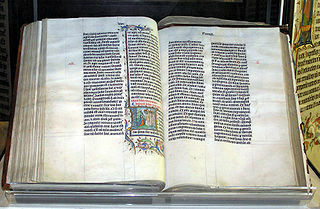 For example, some scholars argue that the Jewish canon was fixed earlier, by the Hasmonean dynasty (140–137 BC). There is a lack of direct evidence on when Christians began accepting their own scriptures alongside the Septuagint. Well into the 2nd century Christians held onto a strong preference for oral tradition as clearly demonstrated by writers of the time, such as Papias. In the face of criticism from Greek philosophers and facing persecution, Apologists wrote to justify and defend Christian doctrine. Justin Martyr's works represent the earliest surviving Christian "apologies" of notable size. Irenaeus of Lyons (c.130–c.202 AD) was bishop of Lugdunum in Gaul, which is now Lyons, France. His writings were formative in the early development of Christian theology, and he is recognized as a saint by both the Eastern Orthodox Church and the Roman Catholic Church. He was a notable early apologetic. He was also a disciple of Polycarp, who was said to be a disciple of John the Evangelist. His best-known book, Against Heresies (c. 180) enumerated heresies and attacked them. Irenaeus wrote that the only way for Christians to retain unity was to humbly accept one doctrinal authority—episcopal councils. Irenaeus was the first to propose that all four gospels be accepted as canonical. Origen ( 184 – 253) taught in Alexandria, reviving the Catechetical School where Clement had taught. Using his knowledge of Hebrew, he produced a corrected Septuagint, and wrote commentaries on all the books of the Bible. He interpreted scripture allegorically, showing Stoic, Neo-Pythagorean, and Platonic influences. Like Plotinus, he wrote that the soul passes through successive stages before incarnation as a human and after death, eventually reaching God. He imagined even demons being reunited with God. For Origen, God was not Yahweh but the First Principle, and Christ, the Logos, was subordinate to him. His views of a hierarchical structure in the Trinity, the temporality of matter, "the fabulous preexistence of souls," and "the monstrous restoration which follows from it" were declared anathema in the 6th century. Hippolytus of Rome (c. 170–235 AD) was one of the most prolific writers of early Christianity. Hippolytus was born during the second half of the 2nd century, probably in Rome. Photius describes him in his Bibliotheca (cod. 121) as a disciple of Irenaeus, who was said to be a disciple of Polycarp, and from the context of this passage it is supposed that he suggested that Hippolytus so styled himself. However, this assertion is doubtful. He came into conflict with the Popes of his time and for some time headed a separate group. For that reason he is sometimes considered the first Antipope. However he died in 235 or 236 reconciled to the Church and as a martyr. Tertullian (c.155–c.240 AD), who was converted to Christianity before 197, was a prolific writer of apologetic, theological, controversial and ascetic works, and sometimes known as the "Father of the Latin Church". He is said to have introduced the Latin term "trinitas" with regard to the Divine (Trinity) to the Christian vocabulary (but Theophilus of Antioch already wrote of "the Trinity, of God, and His Word, and His wisdom", which is similar but not identical to the Trinitarian wording), and also probably the formula "three Persons, one Substance" as the Latin "tres Personae, una Substantia" (itself from the Koine Greek "treis Hypostases, Homoousios"), and also the terms "vetus testamentum" (Old Testament) and "novum testamentum" (New Testament). In his Apologeticus, he was the first Latin author who qualified Christianity as the "vera religio" and systematically relegated the classical Roman Empire religion and other accepted cults to the position of mere "superstitions". Later in life, Tertullian is thought by most to have joined the Montanists, a heretical sect that appealed to his rigorism. Cyprian (200-258) was bishop of Carthage and an important early Christian writer. He was probably born at the beginning of the 3rd century in North Africa, perhaps at Carthage, where he received an excellent classical education. After converting to Christianity, he became a bishop in 249 and eventually died a martyr at Carthage. There was no empire-wide persecution of Christians until the reign of Decius in the third century. As the Roman Empire experienced the Crisis of the Third Century, the emperor Decius enacted measures intended to restore stability and unity, including a requirement that Roman citizens affirm their loyalty through religious ceremonies pertaining to Imperial cult. In 212, universal citizenship had been granted to all freeborn inhabitants of the empire, and with the edict of Decius enforcing religious conformity in 250, Christian citizens faced an intractable conflict: any citizen who refused to participate in the empire-wide supplicatio was subject to the death penalty. Although lasting only a year, the Decian persecution was a severe departure from previous imperial policy that Christians were not to be sought out and prosecuted as inherently disloyal. 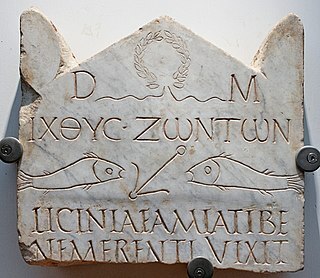 Even under Decius, orthodox Christians were subject to arrest only for their refusal to participate in Roman civic religion, and were not prohibited from assembling for worship. Gnostics seem not to have been persecuted. The Edict of Serdica was issued in 311 by the Roman emperor Galerius, officially ending the Diocletianic persecution of Christianity in the East. With the passage in 313 AD of the Edict of Milan, in which the Roman Emperors Constantine the Great and Licinius legalised the Christian religion, persecution of Christians by the Roman state ceased. 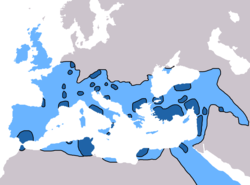 Christianity spread to Aramaic-speaking peoples along the Mediterranean coast and also to the inland parts of the Roman Empire, and beyond that into the Parthian Empire and the later Sasanian Empire, including Mesopotamia, which was dominated at different times and to varying extents by these empires. In AD 301, the Kingdom of Armenia became the first to declare Christianity as its state religion, following the conversion of the Royal House of the Arsacids in Armenia. With Christianity the dominant faith in some urban centers, Christians accounted for approximately 10% of the Roman population by 300, according to some estimates. ^ Paul King Jewett, Infant Baptism and the Covenant of Grace, (Eerdmans 1978), p. 127. ^ "Since at our birth we were born without our own knowledge or choice, by our parents coming together, and were brought up in bad habits and wicked training; in order that we may not remain the children of necessity and of ignorance, but may become the children of choice and knowledge, and may obtain in the water the remission of sins formerly committed, there is pronounced over him who chooses to be born again, and has repented of his sins, the name of God the Father and Lord of the universe; he who leads to the laver the person that is to be washed calling him by this name alone." "The First Apology, Chapter 61". New Advent. Retrieved 14 December 2013. ^ Bradshaw, Paul F. (2002). The Search for the Origins of Christian Worship. Oxford University Press. pp. 78–80. ISBN 978-0-19-521732-2. ^ Bradshaw, Paul; Johnson, Maxwell E.; Philips, L. Edwards (2002). The Apostolic Tradition: A Commentary. Hermeneia. Minneapolis: Fortress Press. ISBN 978-0-8006-6046-8. ^ "The delay of baptism is preferable; principally, however, in the case of little children. For why is it necessary ... that the sponsors likewise should be thrust into danger? ... For no less cause must the unwedded also be deferred—in whom the ground of temptation is prepared, alike in such as never were wedded by means of their maturity, and in the widowed by means of their freedom—until they either marry, or else be more fully strengthened for continence" (On Baptism 18). ^ "The Didache, representing practice perhaps as early as the beginning of the second century, probably in Syria, also assumes immersion to be normal, but it allows that if sufficient water for immersion is not at hand, water may be poured three times over the head. The latter must have been a frequent arrangement, for it corresponds with most early artistic depictions of baptism, in Roman catacombs and on sarcophagi of the third century and later. The earliest identifiable Christian meeting house known to us, at Dura Europos on the Euphrates, contained a baptismal basin too shallow for immersion. Obviously local practice varied, and practicality will often have trumped whatever desire leaders may have felt to make action mime metaphor" (Margaret Mary Mitchell, Frances Margaret Young, K. Scott Bowie, Cambridge History of Christianity, Vol. 1, Origins to Constantine (Cambridge University Press 2006 ISBN 978-0-521-81239-9), pp. 160–61). ^ Duffy (2002), pg. 12. ^ Esler (2004). pp. 893–94. ^ Siker (2000). Pp 233–35. ^ a b Cite error: The named reference Harris was invoked but never defined (see the help page). ^ Schimmelpfennig (1992), pp. 49–50. ^ Kling (2004), pp. 64, 66. ^ Barrett, et al (1999), pg 116. ^ Bart D. Ehrman (1997). The New Testament: A Historical Introduction to the Early Christian Writings. Oxford University Press. p. 8. ISBN 978-0-19-508481-8. The New Testament contains twenty-seven books, written in Greek, by fifteen or sixteen different authors, who were addressing other Christian individuals or communities between the years 50 and 120 (see box 1.4). As we will see, it is difficult to know whether any of these books was written by Jesus' own disciples. ^ a b White (2004). pp. 446–47. ^ Philip R. Davies, in The Canon Debate, p. 50: "With many other scholars, I conclude that the fixing of a canonical list was almost certainly the achievement of the Hasmonean dynasty." ^ Françoise Monfrin, entry on "Milan," p. 986, and Charles Pietri, entry on "Persecutions," p. 1156, in The Papacy: An Encyclopedia, edited by Philippe Levillain (Routlege, 2002, originally published in French 1994), vol. 2; Kevin Butcher, Roman Syria and the Near East (Getty Publications, 2003), p. 378. On the Detection and Overthrow of the So-Called Gnosis, sometimes called Adversus Haereses, is a work of Christian theology written in Greek about the year 180 by Irenaeus, the bishop of Lugdunum. The Church Fathers, Early Church Fathers, Christian Fathers, or Fathers of the Church were ancient and influential Christian theologians and writers. There is no definitive list. The era of these scholars who set the theological and scholarly foundations of Christianity largely ended by AD 700.